A pip is the smallest unit that can be traded in Forex. The word comes from the British word for a small seed in a fruit like an orange, although you will also see pip defined as “percentage in point,” since a pip is equal to 1/100th of 1 percent. Technically, the smallest tradable unit in futures is named a “tick” and in equities, a “point,” but in practice, many professional Forex traders do not say “pips” but rather “points.” You can always spot a real beginner when he uses the phrase “basis points” instead of points or pips. Basis points refers to interest rate securities, not to Forex. The use of the word pips came back into vogue in the late 90’s when retail spot Forex trading started to become widespread. Forex rates classically are calibrated to the fourth decimal place, so a quote for EUR/USD might be 1.3801. That last digit 1 is one pip. During the early 2000’s, brokers started making quotes using the fractional pip, or a fifth digit past the decimal point, like 1.38015. A fractional pip is a tenth of a pip. Brokers advertised fractional pips as allowing the trader to get a tighter bid-ask spread and to take advantage of smaller price moves, but fractional pips also lured traders with only tiny amounts of trading capital into the market, and facilitated high-speed algo traders. Do enough profitable trades making only one fractional pip and soon you are talking about some real money. Another high-speed user of the fractional pip is the spread bettor. The retail electronic platforms that introduced fractional pip pricing were followed, reluctantly and with much grumbling, by the professional platforms. Many professional traders refuse to use the fractional pip, especially in the GBP. At least one big spot data vendor — Reuters — does not use the fractional pip. On the Reuters quote screen, the fractional pip is shown, but when you download data to your own PC, the space for it is there but every quote has a zero at the fifth decimal place. The financial press reported in early 2013 that the Forex quotation convention would be returning to four decimal places, but evidently this was the brainstorm of some committee and the story sank like a stone and out of sight. What Is a Pip Worth? A pip’s value depends entirely on which quotation methodology is in force. In currencies that are quoted in the American quotation convention, like the euro/dollar, each pip is worth $10 in the standard contract and each fractional pip is worth $1. In the mini contract, each pip is worth $1 and each fractional pip is worth 10 cents. The other major currencies quoted this way are the GBP, CAD, AUD, and NZD. When the quotation convention is the European convention, as in USD/CHF, USD/JPY and others, the value of one pip is denominated in the second currency. So one pip in USD/CHF is worth CHF 10, and to translate that into dollar terms, you need to use the exchange rate that was applicable when the trade was closed. In other words, each pip is worth $1 in the mini contract ($10,000) and the calculation is easy — you made $30.00. If you were trading the $100,000-size contract, your gain would obviously be ten times bigger. If your trade is in the USD/CHF, however, points gained or lost are denominated in Swiss francs and if you are keeping track of the P&L in dollar terms, you need to translate the Swiss franc to dollars. Let’s say you bought a mini contract of USD/CHF at 0.8910 and sold it for 0.8940 for a gain of 30 points. As a rule, if you are trading the standard contract, one pip is worth roughly — very roughly – $10 and if you are trading the mini contract, each pip is worth roughly $1. Nevertheless, do not be careless about keeping track of the pennies. As just demonstrated, 30 points in the Swiss franc is $3.56 more than $30, and in the yen, it is $1.20 less. Exotic currencies include the South African rand (ZAR), Mexican peso (MXN), the Hong Kong dollar (HKD), the Nordic currencies (Swedish krona, SEK, Norwegian krone, NOK, and Danish krone, DKK) as well as a slew of emerging market currencies like the Turkish lira (TRY), Indian rupee (INR), and Indonesian rupiah (IDR). You might also include the Russian ruble (RUB) and Argentine peso (ARS). Some websites today say that any currency pair that does not include the USD is an “exotic” currency but this is not the standard usage and creates confusion. A currency pair that does not include the dollar, such as EUR/GBP, is named a “cross-currency.” There is nothing “exotic” about either party to that pair! Moreover, the USD/ZAR is indeed considered an “exotic” even though it includes the dollar. The word exotic is probably used to refer to currencies that have low liquidity and are not traded in the very large amounts that the majors enjoy, such as the EUR/USD. The majors are the majors because they are active — high volumes — and therefore liquid. As noted above, when the dollar is the second name in a pair, you can usually assume the pip size is $0.10 per micro-lot, $1 per mini-lot, and $10 per standard lot. When the currency pair has the dollar as the first-named currency of the pair, the amounts being bought and sold refer to the other currency and you have to translate those into dollars at the ending amount. Most exotic currencies are quoted as USD/TRY for the Turkish lira against the dollar, for example, or EUR/TRY for the lira against the euro. We offer a convenient pip value calculator that works with any currency pair and allows a lot of customization based on your account currency, currencies you trade, and the position size you use. The important thing about exotic currencies is that the pip value tends to be much smaller than in the majors, as in the Turkish lira case above. This means you can trade more lots or a larger lot size with the same amount of starting capital. Another important point about exotic currencies is that when they move, they move like a rocket. The EUR/USD can look positively staid in comparison. 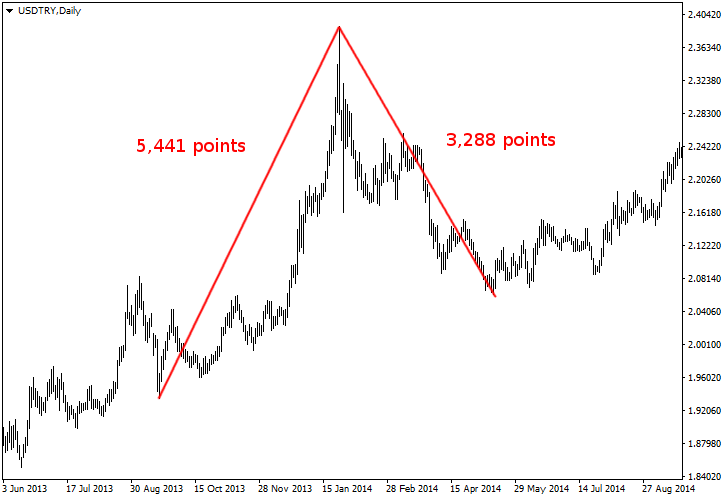 See the 2013-2014 chart of USD/TRY below. The first move upward from lowest low to highest high encompasses 5,441 points and the downmove from highest high to lowest low is 3,288 points, and both moves are relatively tidy, although the second move goes sideways for a while before resuming the downtrend. In the euro/dollar over the same dates as the first upmove, the number of points of net gain is a mere 213. Are exotics more trending than the majors? Yes, when there is a crisis that affects their currencies. Moreover, when there is a crisis in one emerging market, quite often — but not always — it contaminates other exotic currencies too. Because of the relatively lower pip sizes, you can add a second exotic currency to your positions with relatively less risk than in the majors. However, beware! You can also get catastrophic spikes, as shown in the figure right after the highest high. 1. In Forex, you can refer to the smallest trading unit as a point instead of a pip. 2. Forex rates are quoted to how many digits past the decimal point at maximum? 3. A fractional pip is worth how much of a full pip? 5. Each pip in a standard USD-based contract is worth how much? Topic 08 - How Is Money Made in Forex? Topic 01 - What Is Forex Trading? Topic 02 - Why Do Currency Rates Change? Topic 03 - Why Trade Forex?